ISSN: 2397-9607 Issue 126In issue 126 of the Baba Indaba Children's Stories, Baba Indaba narrates a story about a French gentleman, Alexandre Décamps, who, in 1830, when the shooting season started, kitted himself out to join the shooting parties and bag himself some wild fowl. Despite his expense all Alexandre bagged was – a frog! Having a philosophical nature, Alexandre names the frog Mme. Camargo and takes the frog home with him, where he adds it to his already extensive menagerie. .....…… Download and read about how Mme. Camargo helps Alexandre in and around his apartment.Baba Indaba is a fictitious Zulu storyteller who narrates children's stories from around the world. 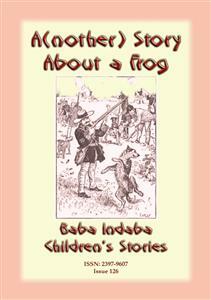 Baba Indaba translates as "Father of Stories".Each issue also has a "WHERE IN THE WORLD - LOOK IT UP" section, where young readers are challenged to look up a place on a map somewhere in the world. The place, town or city is relevant to the story, on map. HINT - use Google maps.INCLUDES LINKS TO DOWNLOAD 8 FREE STORIES33% of the profit from the sale of this book will be donated to charities.